Federal University Oye, Ekiti, located within Oye community, was one of the nine Federal Universities established by the Federal Government of Nigeria, pursuant to an executive order made by the President of the Federal Republic of Nigeria, His Excellency, Dr. Goodluck Ebele Jonathan, GCFR. 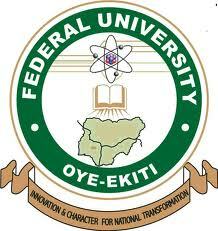 Federal University Oye-Ekiti, whose pioneer Vice Chancellor, is Professor Chinedu Ostadinma Nebo, OON, has two campuses at Oye-Ekiti and Ikole-Ekiti. The management of the Federal University of Oye-Ekiti (FUOYE) has released the cut-off mark for the 2018/2019 academic session admission exercise. WATER RESOURCES MGT & AGRO MET.